Q. I'm thrilled to see grocery stores once again selling rosemary "trees" in time for the holidays! I'm looking forward to giving several as gifts to friends that enjoy cooking - and keeping one for myself, too! Is there any special trick to keep them thriving all winter long here in Central New York? 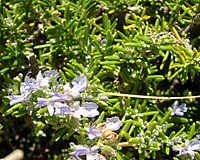 A. Rosemary (Rosmarinus officinalis), below left, is native to dry woodlands and rocky, brush-covered hillsides throughout Mediterranean regions that have more than two hundred bright, sunny days and receive less than twenty inches of rain each year. As a testament to this plants preference for hot, dry conditions, I've seen it used as a landscape shrub in parking lot islands in Tucson, Arizona, below right. Can you imagine how hot these plants must get on a July day with the sun beating down on the asphalt parking lot and air temperatures over 110°F? Yet, they can also tolerate occasional light, overnight frosts during the winter months. With all of this this in mind, consider that several weeks ago the rosemary plants you're thinking of buying were stuffed inside a pitch black semi-trailer. They then spent at least several days wandering the interstate highway system as the truck gradually made its way to Central New York - after growing for months in a bright, sunny greenhouse or nursery in California, Texas, Alabama, Georgia, or Florida. Upon their arrival, these plants will have been displayed inside the grocery store for at least a couple of days before you bring them home. This is where the story can get really ugly. If you stop reading for a moment and look out that window, it's probably either dark - or cloudy! In a nutshell, rosemary plants need the bright, intense sunlight typical of the Mediterranean - or parking lot in Arizona! Your best chance of getting these plants through the winter will be to replant them into clay pots filled with a peatmoss-based potting soil such as Pro-Mix, Jiffy-Mix, etc. Clay pots are preferred because they make it more difficult to overwater plants indoors. Next, set the plants in a room that remains relatively cool - maybe only sixty to sixty-five during the day and between forty and fifty degrees at night (temperatures quite similar to what's experienced in Tucson during the winter months). The room should also let in plenty of sunlight on those relatively few, cloudless winter days we do receive here in Central New York. Even then, you might want to set your plants under a set of inexpensive, florescent shop lights that are set to go on at sunset and off around 2:00 each morning. Finally, let your rosemary plants go slightly dry to the touch between waterings. In a cool room, this may mean that you'll water them only every other week until days start getting significantly longer and warmer in late March and early April. At that point, you might even want to set your plants outside where they'll receive direct sun on days when temperatures rise into the fifties - just remember to bring them back in at night. Finally, once the chance of frost is passed, it'll be time for your rosemary plants to spend rest of the summer in the hottest, sunniest spot in your garden - if they survive the winter!